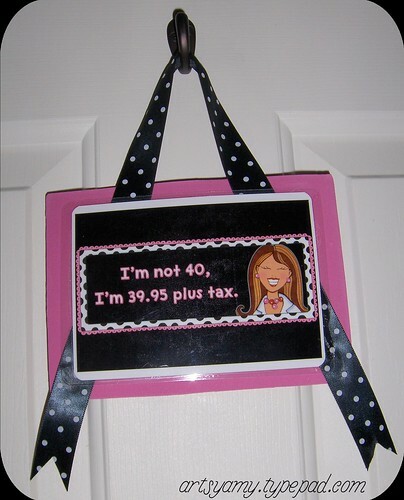 A gift I made on the quick for a dear friend's 40th blowout. Had a party not been involved, she would've been added to the ever growing list I owe birthday gifts. Random ramblings organized for y'all. This is a Flickr badge showing items in a set called Artsy Amy - Handmade. Make your own badge here. This is a Flickr badge showing public items from the Country Chic Crafts group pool. Make your own badge here. This is a Flickr badge showing public items from the Country Chic Home group pool. Make your own badge here. Straight from my Google Reader. This list is constantly being updated because I'm moody like that. Because it makes you smarter. This work by artsy Amy White is licensed under a Creative Commons Attribution-Noncommercial-No Derivative Works 3.0 United States License 2007-2012. All photos, writings, and tutorials are copyrighted and unless otherwise credited, all work on this website is my own. Making my blog look all fancy like.